What Performance Features Come With the Chrysler 300? If you want a full-size luxury sedan that offers innovative features, you should check out the Chrysler 300. At C.H. 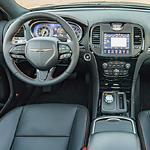 Urness Motor Company, we strive to keep you informed about our models, so you can read about a few performance features that come with the Chrysler 300 below. With the Chrysler 300, you have two engines to choose from. The standard engine is the award-winning 3.6L Pentastar V6 engine that is paired with an eight-speed automatic transmission. This engine provides you with outstanding efficiency and offers 30 highway mpg. The other engine is the 5.7L HEMI V8 engine that offers best-in-class horsepower and Fuel Saver Technology. This engine can deliver 363 horsepower and 394 lb.-ft. of torque. Another notable performance feature that is available with the Chrysler 300 is an advanced all-wheel-drive system. This system has the ability to activate at any speed and adjusts to your driving style and the surface of the road for optimal traction.